GB accumulators have low-BAL-affinity isoenzymes containing Ile. Therefore, BADH activity appears to restrict GB synthesis in non-GB-accumulator plants. Alanine scanning of both helices of the putative helix-turn-helix DNA-binding motif of TyrR ... interactions between TyrR protein and DNA targets by in vitro. Instance Based Query Generation is defined and applied to the problem of recognis- ing amino acid residues in medium resolution critical point graphs. Jan 15, 2009 - Chyun Chen - [email protected]; Yi-Jin Chen - [email protected]; Ching-Ting Lin - [email protected]; Tin-. SARLLESVLESKRMLGRGRRSAEAMGLEKKNKI. Arhl Tra hom. Arhl Enc cun. Arhl Enc int. Arhl Nos cer. Arhl Ent bie. Arhl Sac cer. Arhl Neu cra. Arhl_Hom_sap. recognize and bind its DNA target (the lux box) or to establish associations with RNA polymerase (RNAP) at the lux operon promoter necessary for transcriptional initiation. A third in vivo assay was used to test the ability of the altered forms of LuxR to bind to the lux box (DNA binding assay/repression). All of the LuxR variants exhibiting the “dark” phenotype in the luminescence and luciferase assay were also found to be unable to bind to the lux box in the DNA binding assay. Therefore, it can be concluded that the alanine substitutions made at these positions affect the ability of LuxR to bind to the lux box in the presence and absence of RNA polymerase. Another class of mutants exhibited wildtype phenotypes in the luminescence and luciferase assays but were unable to bind to the lux box in the DNA binding assay. The alanine substitutions made at these amino acid residues may be making contacts with RNAP that are important for maintaining the stability of the DNA binding region of LuxR. Alanine substitutions made at these positions have a defect in DNA binding at the promoter of the lux operon only in the absence of RNAP. 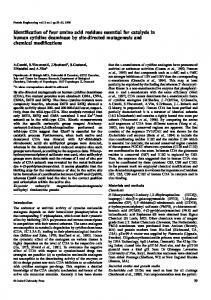 None of the alanine substitutions made in the C-terminal forty-one amino acids of LuxR were found to affect activation of transcription of the lux operon without also affecting DNA binding. Taken together, these results support the conclusion that the C-terminal forty-one amino acids of LuxR are important for DNA recognition and binding of the lux box rather than positive control of the process of transcription initiation. ACKNOWLEDGEMENTS I would like to thank my advisor, Ann Stevens, for her time and patience in helping me complete this project (sorry about that gray hair). I would also like to thank my committee members, Timothy Larson and David Popham, for their much appreciated advice over the course of the last three years. I also owe a special debt of gratitude to the previous and current members of the lab that have somehow managed to tolerate me during all my failed experiments: Robert Blick, Angi Finney, Melissa Fouratt, Deborah Johnson, and Guy Townsend. I would like to give Guy Townsend an extra “thank you” for his technical assistance during the last phase of the project. 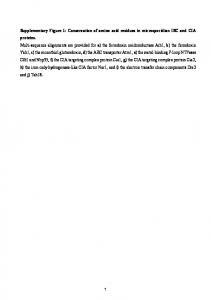 Do any of the alanine substitutions in LuxR result in an enhanced ability to activate transcription of the lux operon? Do any of the alanine substitutions in LuxR result in its ability to activate transcription of the lux operon independent of autoinducer? Are the altered forms of LuxR expressed at levels equivalent to the wildtype? 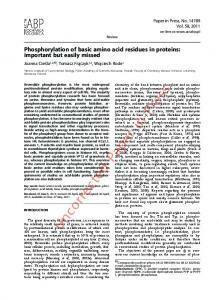 Do the alanine substitutions in LuxR affect its ability to bind to the lux box? Figure 1: Model of quorum sensing in Vibrio fischeri. Figure 2: Vibrio fischeri autoinducer, N-(3-oxohexanoyl) homoserine lactone (3-oxo-C6HSL or VAI). 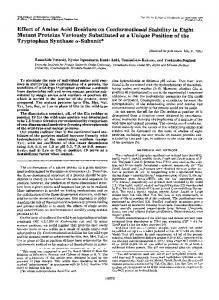 code for antibiotics and enzymes important for pathogenesis. It is of interest to understand quorum sensing in V. fischeri at the molecular level such that the information may be applied to these other less understood systems. A better understanding of the mechanism of transcriptional activation employed at the promoter of the lux operon of V. fischeri may eventually lead to the development of ways to interfere with the transcriptional activation of the genes necessary for the virulence of these other medically and agriculturally important microorganisms (Fuqua et al., 1996). P. aeruginosa is known to control expression of several of its virulence genes by quorum sensing, including an exotoxin, alkaline protease, and elastin-specific protease (Fuqua et al., 1994). The activation of these genes is dependent upon the binding of the autoinducer to a LuxR homologue, LasR. Therefore, only after a significant cell density of P. aeruginosa has been reached at the site of infection will these virulence genes be expressed. The advantage of regulating the virulence genes in this manner is the ability to avoid detection by the immune system of the host while cell numbers are low. It can be compared to an army waiting to show its true strength only after all the troops have arrived to the scene. By the time the host has realized the strength of the enemy, it is too late to completely defend itself (Greenberg, 1997). This type of control of the expression of virulence determinants can also be found in the process of the infection of plant tissues by Erwinia carotovora. When sufficient numbers of the bacteria have colonized, the plant tissue exoenzyme genes are turned on, allowing the cell wall of the plant to be degraded (Fuqua et al., 1994). By allowing a release of nutrients from the breakdown of the cell wall, an opportunity arises for nutritional competitors. It has been found that the E. carotovora responds by producing the antibiotic carbapenem. The gene for this antibiotic is under the control of the same autoinducer/LuxR homologue, ExpR, that activates the genes for the exoenzyme production. By producing the antibiotic in conjuction with the exoenzymes, competitors for the plant’s nutrients can be reduced (Salmond et al., 1995). Figure 3: Model of the important functional regions of LuxR (based on Figure 2 in Stevens & Greenberg, 1999). involved in quorum sensing produce a distinct N-acyl-L-homoserine lactone signal; many release signals that are structurally identical, but differ in the phenotype that they induce. Likewise, some bacteria may produce more then one structural type of autoinducer, with each signal affecting expression of a different phenotype (Swift et al., 1996). The amino terminal region of LuxR homologues can distinguish between their cognate autoinducers and the autoinducers of other bacteria that vary in chemical structure. 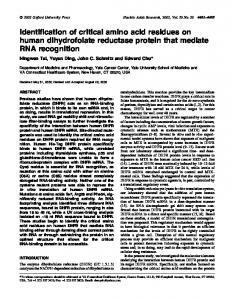 It has been found that changes in either chain length or the homoserine lactone ring affect the activity of the LuxR protein (Fuqua et al., 1996; Schaefer et al., 1996). The arrangement of the lux genes in V. fischeri is such that luxI and luxR are divergently transcribed (Figure 4). Although this is the most common gene arrangement in quorum sensing systems, other arrangements of the luxR/luxI homologues exist. For example, some systems have the 3’ ends of these genes overlapping, while others are transcribed in the same direction (Fuqua et al., 1996). In V. fischeri, a region called the lux box has been found to be important for the regulation of the transcription of both luxR and luxI. Although full-length LuxR has not been purified, it has been possible to purify the C-terminal domain of LuxR, LuxR∆N. The lux box region, centered at –42.5 bp from the trancription start site of luxI, is thought to be bound by LuxR in the presence of the V. fischeri autoinducer. In in vitro studies using the LuxR Cterminal domain, it was determined that LuxR∆N and RNA polymerase must both be present to have DNaseI protection of this lux box site (Stevens et al., 1994). It has been suggested that LuxR may bind to RNA polymerase in solution, thus facilitating binding of the two proteins to the lux box and the lux promoter (Stevens and Greenberg, 1997). However, recent genetic evidence has demonstrated the ability of LuxR to bind specifically to the lux box while functioning as an artificial repressor of the transcription a downstream reporter gene (Egland and Greenberg, 2000). Figure 4: Arrangement of the Vibrio fischeri lux genes (based on Figure 1 in Stevens et al., 1994). assay). Mutants unable to activate transciption of the lux operon resulted in cells emitting little or no light. The identification of mutants exhibiting this “dark” phenotype were verified directly through the measurement of the luciferase enzyme found within cell extracts of strains expressing the variant forms of LuxR (luciferase assay). Since a “dark” phenotype could be the result of a mutation that either affects an amino acid residue critical for DNA binding or formation of the complex necessary for transcriptional activation, a third assay (DNA binding/repression assay) was used to measure the ability of the variant forms of LuxR to bind to the region of DNA found at the promoter of the lux operon, termed the lux box. LuxR variants exhibiting the “dark” phenotype in the luminescence and luciferase assays that retain the ability to bind to the lux box have a mutation that affects an amino acid residue critical for formation of the transcriptional complex that activates expression of the lux operon. LuxR variants exhibiting the “dark” phenotype that are unable to bind to the lux box have a mutation that affects an amino acid residue critical for DNA binding/recognition at the promoter of the lux operon. A better understanding of the interactions occurring between LuxR and RNA polymerase at the lux operon promoter will likely be applicable to the interactions seen in homologous quorum sensing systems. Furthermore, an amino acid sequence alignments of LuxR with some of its homologues, have identified several positions in the C-terminal forty amino acids of LuxR that are identical or functionally similar to amino acids found at the same position in many of the other LuxR homologues (Stevens and Greenberg, 1999b). Since many of the LuxR homologues are responsible for the transcriptional activation of genes important for symbiotic or pathogenic interactions of microorganisms with plant or animal hosts, the knowledge gained from studying the mechanism of transcriptional activation of the lux operon in V. fischeri has potential medical and agricultural importance. 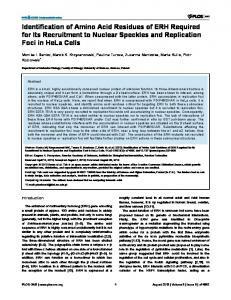 Future research may focus on methods to disrupt or enhance the interactions of the LuxR homologues with RNA polymerase at the promoter region as a method of controlling the phenotypes expressed by microorganisms in these other quorum sensing systems. CHAPTER TWO MATERIALS AND METHODS Bacterial strains and plasmids See Table 1 for descriptions of bacterial strains and plasmids used in this study. Primer design See Tables 2 and 3 for descriptions of primer sequences used in this study (SigmaGenosys, The Woodlands, TX). Two-primer PCR Each of the100 µl PCR reactions for the mutagenesis of amino acid residues 246-250 contained a final concentration of the following reagents: 2 µM of one specific mutant primer, 2 µM XBA200 primer (Sigma-Genosys, The Woodlands, TX), 2 mM dNTPs (Promega, Madison, WI), 2.5 units Taq2000 Polymerase (Stratagene, La Jolla, CA), 1X Taq2000 Reaction Buffer (10 mM Tris-HCl pH 8.8, 50 mM KCl, 1.5 mM MgCl2, 0.001% gelatin) (Stratagene, La Jolla, CA), 2 mM MgS04 (Fisher, Springfield, NJ), and 100 ng of linearized pSC300 (Figure 5) template. The PCR reaction for 215 was followed as described above with one modification; the PVU200 primer was substituted for the XBA200 primer. Template DNA for use in the PCR reactions was prepared using the QIAprep miniprep kit (Qiagen, Valencia, CA), followed by restriction enzyme endonuclease digestion with PvuII (Promega, Madison, WI). The linearized DNA was subsequently electrophoresed on a 0.8% agarose gel (BioRad, Hurcules, CA) and extracted from the agarose matrix using the QIAquick gel extraction kit (Qiagen, Valencia, CA). A Sprint thermal cycler (Hybaid, Middlesex, UK) was programmed as follows for all PCR reactions: one cycle: 94˚C for two minutes; 30 cycles: 94˚C for one minute, 46˚C for one minute, and 72˚C for two minutes; and one cycle: 72˚C for ten minutes. Table 2: Sequences of mutagenic primers Residue of Restriction Alanine Mutant Primer Sequence (5’ to 3’) a Endonuclease Substitution Site Change 210 GGCTGTGCTGAGCGTACTGTCACTTTCC Loss of PstI site 211 GGCTGTAGTGCGCGTACTGTCACTTTCC Loss of PstI site 212 GGCTGTAGTGAGGCTACTGTCACTTTCC Loss of PstI site 213 GGCTGTAGTGAGCGTGCTGTCACTTTCC Loss of PstI site 214 GGCTGTAGTGAGCGTACTGCGACTTTCC Loss of PstI site 215 TAGGCTGCAGTGAGCGTACTGTCGCTTTCC No Change 216 GGCTGTAGTGAGCGTACTGTCACTGCGCATTTAACC Loss of PstI site 217 GGCTGTAGTGAGCGTACTGTCACTTTCGCATTAACC Loss of PstI site 218 GGCTGTAGTGAGCGTACTGTCACTTTCCATGCAACC Loss of PstI site 219 TTAGCAAATGCTCAAATGAAAC Loss of FspI site 220 TTAACCGCAGCGCAAATGAAAC Loss of FspI site 222 TTAACCAATGCGGCAATGAAAC Loss of FspI site 223 TTAACCAATGCTCAAGCGAAAC Loss of FspI site 224 TTAACCAATGCTCAAATGGCACTC Loss of FspI site 225 GAAAGCAAATACAACAAACCGTTGCC Loss of MspAI site 226 GAAACTCGCTACAACAAACCGTTGCC Loss of MspAI site 227 GAAACTCAATGCAACAAACCGTTGCC Loss of MspAI site 228 CTCAATACAGCAAACCGTTGCC Loss of MspAI site 229 CTCAATACAACAGCGCGCTGCC Loss of MspAI site 230 CTCAATACAACAAACGCTTGCC Loss of MspAI site 231 ACAAACCGCGCACAAAGTATTTC Loss of MspAI site 232 ACAAACCGTTGCGCAAGTATTTC Loss of MspAI site 233 ACCGTTGCCAAGCTATTTCTAAAGC Loss of MspAI site 234 ACAAACCGTTGCCAAAGTGCATCTAAAG Loss of MspAI site 235 ACAAACCGTTGCCAAAGTATTGCTAAAG Loss of MspAI site 236 ACCGTTGCCAAAGTATTTCTGCAGCAATTTTAAC Loss of MspAI site 238 TCTAAAGCAGCTTTAACAGGAGCAATCGATTGCCCATA Add a ClaI site 239 CAATTGCAACAGGAGCAATCGATTGCCCATAC Add a ClaI site 240 CAATTTTAGCAGGAGCAATCGATTGCCCATAC Add a ClaI site 241 CAATTTTAACAGCAGCAATCGATTGCCCATAC Add a ClaI site 243 TTAACAGGAGCAGCTGATTGCCCATAC Add a PvuII site 244 CAATTGCTTGCCCATACTTCAAAAATT Loss of DraI site 245 CAATTGATGCGCCATACTTCAAAAATT Loss of DraI site 246 TCCCCCGGGCTATTAATTTTTAAAGTATGCGCAATC No change 247 TCCCCCGGGCTATTAATTTTTAAAAGCTGGGC No change 248 TCCCCCGGGCTATTAATTTTTAGCGTATGG No change 249 TCCCCCGGGCTATTAATTTGCAAAGTATGG No change 250 TCCCCCGGGCTATTAAGCTTTAAAGTATGG No change a Underlined nucleotides are changes made in luxR to code for an alanine residue at the specified location. Boldfaced nucleotides are changes made in luxR for the addition or deletion of the indicated restriction site. Figure 5: Diagram illustrating relevant characteristics of pSC300 (Choi and Greenberg, 1991) and the annealing sites of the PVU200 and XBA200 primers. instructions. The cloning of the 215 PCR product to introduce the mutation at residue 215 into pSC300 was followed using the methods described above with the following changes. The SmaI/XbaI digestion for both pSC300 and the PCR product was replaced by a digestion with PstI (New England BioLabs, Beverly, MA). The vector was subsequently dephosporylated with Calf Intestinal Phosphatase (New England Biolabs, Beverly, MA) prior to the gel extraction procedure. Ligation reactions for all mutants were transformed into E. coli strain JM109 and plated on Luria-Bertani (LB) agar containing 100 µg/ml ampicillin. 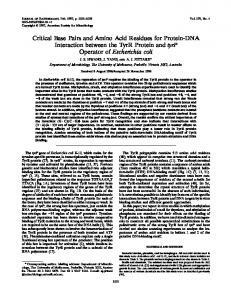 Plasmid DNA derived from both the two-primer PCR method and the three-primer PCR methods was prepared from the transformants using an alkaline-lysis miniprep procedure (Sambrook et al., 1989). Since not all clones of the three-primer method that contain the correct size insert contain the desired mutation, plasmid DNA from the potential mutant clones was screened on the basis of the specific restriction site addition/deletion incorporated by the mutant primer (Table 2). All clones of the two-primer method containing the insert of the correct size should contain the desired mutation, thus it was only necessary for plasmid DNA to be screened for the ligation of the correct size insert into pSC300. The first plasmid identified to contain the desired nucleotide changes to encode for an alanine residue at position 243 was named pAT243A. This method of naming the plasmids containing the mutant forms of luxR was followed for all the luxR clones obtained by the three-primer and two-primer methods. DNA sequencing Plasmid DNA of clones identified as containing the desired mutation was prepared using the QIAprep Miniprep kit. The entire luxR gene and promoter region was sequenced on both strands to verify that no other second site mutations were generated during the PCR and cloning steps of the mutagenesis procedure. All sequencing was completed at the Virginia Tech DNA Sequencing facility using the SEQVEC, SEQINT, SEQPRO, AND SEQINT2 sequencing primers (Table 3). Second site mutations Due to undesired second site mutations in luxR identified during the sequencing of pAT223A and pAT250A, the portion of luxR not containing the second site mutation was recloned into the PstI sites of pSC300 and sequenced as described above. Luminescence assays Plasmids containing the correct luxR mutation were transformed into E. coli JM109 pJR551 (Dunlap and Greenberg, 1985) and selected on LB agar containing ampicillin (100 µg/ml) and chloramphenicol (30µg/ml). Strains were grown in triplicate using the following protocol. Overnight cultures were grown at 30˚C in LB containing the appropriate antibiotics and 200 nM Vibrio fischeri autoinducer, N-(3-oxohexanoyl) homoserine lactone (VAI), (Sigma, St Louis, MO) to an optical density at 600 nm (OD600 ) of 0.200-1.00. The overnight cultures were subcultured into media containing the appropriate antibiotics and VAI to an OD600 of 0.025. These subcultures were subsequently grown at 30˚C to a final OD600 of 0.500. Luminescence output was measured over a four second integration period with a Turner 20/20 luminometer (Turner, Sunnyvale, CA) using 10 µl of culture. Cell pellets were obtained from the centrifugation of 0.5 ml aliquots of each culture and careful removal of the supernatant. The pellets to be used for the luciferase assays were stored at -70°C, while the pellets to be used for SDS-PAGE and Western immunoblotting were stored at -20°C. Luminescence assays were also performed in the absence of autoinducer to determine if the any of the alanine substituion mutations resulted in a form of LuxR that was capable of activating transcription of the lux operon independent of autoinducer. Since the mutation in luxI encoded on pJR551 is a temperature sensitive mutation that will allow LuxI to synthesize autoinducer below 30°C, the strains were grown in duplicate at 31°C in the absence of exogenous autoinducer. 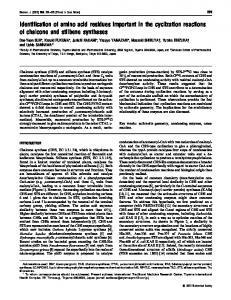 All other conditions of the luminescence assay were performed as described above. subcultured to an OD600 of 0.025 into two sets of LB media containing the appropriate antibiotics. One of the two sets of media also contained 200 nM VAI. Both sets of subcultures were grown at 30˚C to a final OD600 of 0.500 and subsequently placed on ice. A small volume of each subculture (5 µl) was diluted 1:200 in Z buffer (60 mM Na 2HPO4-7H20, 40 mM NaH2PO4H20, 10 mM KCl, 1 mM MgS04-7H20, 400 nM DTT) and lysed using 50 µl of chloroform. βgalactosidase levels of each mutant was measured using the Tropix chemiluminescent reporter assay kit (Tropix, Bedford, MA) and a Lucy microtiter dish luminometer (Anthos, Wals, Austria) as described in Egland and Greenberg (2000). Western immunoblotting Expression levels of the mutant forms of LuxR was measured using western immunoblotting techniques as described in Brahamsha and Greenberg (1988). Cell pellets for the procedure were obtained as desribed above in “Luminescence Assay”. 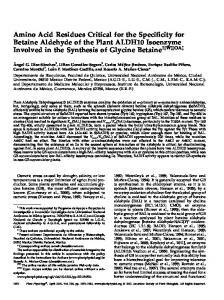 The resolving gel contained a acrylamide concentration of 12%. LuxR primary rabbit antiserum was used at a dilution of 1:1000 (Slock et al., 1990) to probe a nitrocellulose blot using a colorimetric detection system. CHAPTER THREE RESULTS AND DISCUSSION Identifying alanine substitution variants of LuxR defective in transcriptional activation of the lux operon The effect of each of the alanine substitutions constructed for this study on the ability of LuxR to activate transcription of the lux operon was determined in vivo using the reporter plasmid pJR551 (Dunlap and Ray, 1989) and each of the plasmids in the pAT series in recombinant Escherichia coli. Of the 38 strains encoding the alanine substitution mutants tested in this study, seven (residues 212, 217, 225, 229, 230, 238, and 243) were found to emit 2% or less of the levels of luminescence observed with wildtype LuxR, and one (residue 216) was identified to emit approximately 30% of the wildtype levels of luminescence (Figure 6). Those mutant forms of LuxR found in this assay to stimulate cellular luminescence at levels less than 50% the wildtype control were considered to have a significant defect in transcriptional activation of the lux operon. 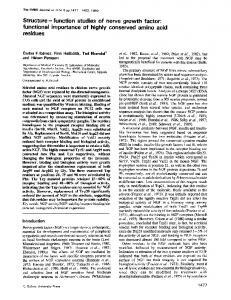 Since it has been shown that several factors such as glucose, iron, and oxygen levels can influence the amount of luminescence emitted from V. fischeri (Ruby and Nealson, 1976; Haygood and Nealson, 1985; Nealson and Hastings, 1977), the quantity of luciferase found in cell extracts obtained from the luminescence assay was directly measured via luciferase assays. Similar to measuring cellular ß-galactosidase, the levels of luciferase found within the cell can be quantitated as a measure of transcriptional activation from the promoter of the lux operon. All seven of the mutants (residues 212, 217, 225, 229, 230, 238, 243) that emitted 2% or less of the wildtype level of luminescence in the luminescence assay were found to have 10% or less of the wildtype levels of luciferase (Figure 7). The one mutant (residue 216) found to emit 30% of the wildtype level of luminescence was found to have less than 40% the wildtype level of luciferase. Figure 6: Effects of alanine subsitutions on LuxR-dependent cellular luminescence in E. coli. The value for each alanine substitution mutant represents the average of three independent experiments. The error bars represent the range of the highest and lowest value from the mean. The wildtype LuxR (pSC300) value, per 10 µl culture at an OD600 of 0.500, was set at 100% for each experiment. The average value for the negative control, pKK223-3 (not shown), was less than 0.01% wildtype levels of luminescence. The letter preceeding each alanine substitution position indicates an abbreviation for the amino acid residue at that position in the wildtype sequence. Figure 7: Effects of alanine substitutions on LuxR-dependent cellular luciferase levels in E. coli. The value for each alanine substitution mutant represents the average of two independent experiments each performed in triplicate. The error bars represent the range of each experiment from the mean. The wildtype LuxR (pSC300) value, per 10 µl culture at an OD600 of 0.500, was set at 100% for each experiment. The negative control, pKK223-3 (not shown), exhibited less that 0.3% wildtype levels of luciferase. The letter preceeding each alanine substitution position indicates an abbreviation for the amino acid residue at that position in the wildtype sequence. Figure 8: Western immunoblot of cell extracts from strains exhibiting the “dark” phenotype (< 50% luminescence/luciferase levels of wildtype). The LuxR band is highlighted with an asterisk (*) on the right. The mobility of molecular weight size standards is indicated by arrow heads. The position of the alanine substitution in LuxR is given at the top. The positive control “+C” lane illustrates wildtype LuxR expressed from pSC300. The negative control “-C” lane illustrates the negative/vector control (pKK223-3). Figure 9: Effects of alanine substitutions on the ability of LuxR to bind to the lux box in E. coli. The value for each alanine substitution mutant represents the average of two independent experiments each performed in triplicate. The error bars represent the range of each experiment from the mean. The wildtype value (pSC300), per 5 µl culture at an OD 600 of 0.500 diluted 1:200, was set at 100% for each experiment with the actual average being equivalent to 7.48+0.75 fold repression for all experiments. The negative/vector control (pKK223-3) value shown in the graph is the average value from all experiments. The letter preceeding each alanine substitution position indicates an abbreviation for the amino acid residue at that position in the wildtype sequence. (Figure 9; Table 4). Since these nineteen mutants also exhibited the wildtype luminescent phenotype in the luminescence and luciferase assays, we conclude that the alanine substitutions made at these positions in LuxR do not affect the DNA binding or transcriptional activation functions of the protein. These mutant forms of LuxR are considered to be equivalent to wildtype. All eight mutants exhibiting the “dark” phenotype in the luminescence and luciferase assays were found to have 20% or less wildtype levels of repression (Figure 9; Table 4). It can be concluded that the alanine substitutions made at these positions affect the ability of LuxR to bind to the lux box in the presence and absence of RNA polymerase (RNAP). Interestingly, eleven of the mutants that exhibited the wildtype luminescent phenotype in the luminescence and luciferase assay were also unable to bind to the lux box in the DNA binding assay (Figure 9; Table 4). It is hypothesized that these altered forms of LuxR have a defect in DNA binding that can be suppressed through interactions with RNA polymerase (RNAP) at the promoter of the lux operon, thus accounting for the observed wildtype luminescent phenotype. The alanine substitutions made at these amino acid residues may be making contacts with RNAP that are important for maintaining the stability of the DNA binding region. Egland and Greenberg (2000) found that LuxR∆N, a truncated form of LuxR containing only the C-terminal domain of LuxR (Stevens and Greenberg, 1997), was unable to bind to the lux box in the in vivo DNA binding assay, even though luminescence and luciferase assays suggest that this truncated form of the protein is capable of transcriptional activation of the lux operon equivalent to wildtype LuxR (Choi and Greenberg, 1991). Since purified LuxR∆N has been previously shown in vitro to require RNAP for binding to the lux box at the promoter of the lux operon (Stevens and Greenberg, 1997) it is hypothesized that this form of LuxR, as seen with eleven of the alanine substitution mutants in this study (Table 4), has a defect in DNA binding that can be stabilized by interactions with RNAP. the mechanism of transcriptional activation used by LuxR will be applicable to other quorum sensing systems (Stevens and Greenberg, 1999b). CHAPTER FOUR REFERENCES Baikalov, I., I. Schröder, M. Kaczor-Grzeskowiak, K. Grzeskowiak, R. P. Gunsalus, and R. E. Dickerson. 1996. Structure of the Escherichia coli response regulator NarL. Biochemistry 35:11053-11061. Brahamsha, B., and E. P. Greenberg. 1988. 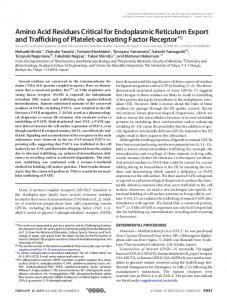 A biochemical and cytological analysis of the complex periplasmic flagella from Spirochaeta aurantia. J. Bacteriol. 170:4023-4032. Choi, S. H., and E. P. Greenberg. 1991. The C-terminal region of the Vibrio fischeri LuxR protein contains an inducer-independent lux gene activating domain. Proc. Natl. Acad. Sci. USA 88:11115-11119. Choi, S. H., and E. P. Greenberg. 1992. Genetic dissection of DNA binding and luminescence gene activation by the Vibrio fischeri LuxR protein. J. Bacteriol. 174:4064-4069. Dunlap, P. V. and E. P. Greenberg. 1985. Control of Vibrio fischeri luminescence gene expression in Escherichia coli by cyclic AMP and cyclic AMP receptor protein. J. Bacteriol. 164:45-50. Dunlap, P. V., and E. P. Greenberg. 1988. Control of Vibrio fischeri lux gene transcription by a cyclic AMP receptor protein-LuxR protein regulatory circuit. J. Bacteriol. 170:4040-4046. Dunlap, P. V., and J. M. Ray. 1989. Requirement for autoinducer in transcriptional negative autoregulation of the Vibrio fischeri luxR gene in Escherichia coli. J. Bacteriol. 171:3549-3552. Eberhard A., A. L. Burlingame, C. Eberhard, G. L. Kenyon, and N. J. Oppenheimer. 1981. Structural identification of autoinducer of Photobacterium fischeri luciferase. Biochemistry 20:2444-2449. Egland, K. A., and E. P. Greenberg. 2000. Conversion of the Vibrio fischeri transcriptional activator, LuxR, to a repressor. J. Bacteriol. 182:805-811. Fuqua, C. W., S. C. Winans, and E. P. Greenberg. 1994. Quorum sensing in bacteria: the LuxR-LuxI family of cell density responsive transcriptional regulators. J. Bacteriol. 176:269275. Fuqua, C. W., S. C. Winans, and E. P. Greenberg. 1996. Census and consensus in bacterial ecosystems: The LuxR-LuxI family of quorum-sensing transcriptional regulators. Annu. Rev. Microbiol. 50:727-51. Greenberg, E. P. 1997. 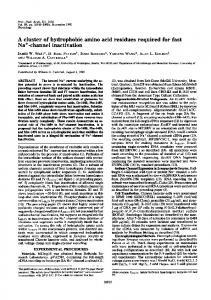 Quorum sensing in gram-negative bacteria. ASM News. 63:371-377. Hanzelka, B. L. , and E. P. Greenberg. 1996. 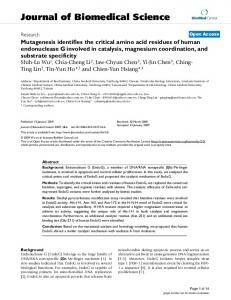 Quorum sensing in Vibrio fischeri: evidence that S-Adenosylmethionine is the amino acid substrate for autoinducer synthesis. J. Bacteriol. 178: 5291-5294. Hanzelka, B. L. , and E. P. Greenberg. 1995. Evidence that the N-terminal region of the Vibrio fischeri LuxR protein constitutes an autoinducer-binding domain. J. Bacteriol. 177:815817. Haygood, M. G., and K. H. Nealson. 1985. The effect of iron on the growth and luminescence of the symbiotic bacterium Vibrio fischeri. Symbiosis. 1:39-51. Michael, S. F. 1994. Mutagenesis by incorporation of a phosphorylated oligo during PCR amplification. BioTechniques 16:410-412. Nealson, K. H., and J. W. Hastings. 1977. Low oxygen is optimal for luciferase synthesis in some bacteria. Arch. Microbiol. 112:9-16. Poellinger, K. A., J. P. Lee, J. V. Parales, Jr., and E. P. Greenberg. 1995. Intragenic suppression of a luxR mutation: characterization of an autoinducer-idependent LuxR. FEMS Microbiol Lett. 129:97-102. Ruby, E. G., and K. H. Nealson. 1976. Symbiotic association of Photobacterium fischeri with the marine luminous fish Monocentris japonica: a model for symbiosis based on bacterial studies. Biol. Bull. 151:574-586. Salmond, G. P. C., B. W. Bycroft, G. S. A. B. Stewart, and P. Williams. 1995. The bacterial ‘enigma’: cracking the code of cell-cell comunication. Molecular Microbiology. 16:615-624. Sambrook, J., Fritsch, E.F. & Maniatis, T. 1989. 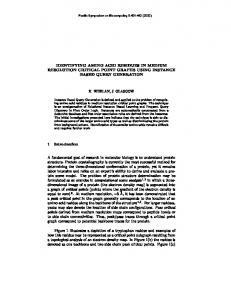 Molecular Cloning: A Laboratory Manual (Cold Spring Harbor Lab. Press, Plainview NY), 2nd Ed. Schaefer, A. L., D. L. Vale, B. L. Hanzelka, J. E. Cronan, Jr., and E. P. Greenberg. 1996. Generation of cell-to-cell signals in quorum sensing: acyl homoserine lactone synthase activity of a purified Vibrio fischeri LuxI protein. Proc. Natl. Acad. Sci. USA 93:9505-9509. Shadel, G. S., J. H. Devine, and T. O. Baldwin. 1990. Control of the lux regulon of Vibrio fischeri. J. Biolumin. Chemilumin. 5:99-106. Sitnikov, D. M., G. S. Shadel, and T. O. Baldwin. 1996. Autoinducer-independent mutants of the LuxR transcriptional activator exhibit differential effects on the two lux promoters of Vibrio fischeri. Mol. Gen. Genet. 252:622-625. Slock, J., D. VanRiet, D. Kolibachuk, and E. P. Greenberg. 1990. Critical regions of the Vibrio fischeri LuxR protein defined my mutational analysis. J. Bacteriol. 172:3974-3979. Stevens, A. M., and E. P. Greenberg. 1999a. Involvement of the RNA polymerase a-subunit C-terminal domain in LuxR-dependent activation of the Vibrio fischeri luminescence genes. J. Bacteriol. 181:4704-4707 Stevens, A. M., and E. P. Greenberg. 1999b. 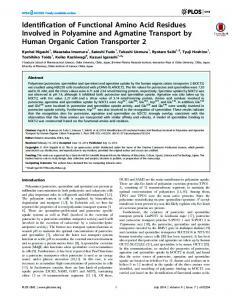 Transcriptional Activation by LuxR, p. 231-242. In G. M. Dunny and S. C. Winans (ed. ), Cell-Cell Signaling in Bacteria. American Society for Microbiology, Washington, D.C. Stevens, A. M. , and E. P. Greenberg. 1997. Quorum sensing in Vibrio fischeri : essential elements for activation of the luminescence genes. J. Bacteriol. 179:557-562. Stevens, A. M., K. M. Dolan, and E. P. Greenberg. 1994. Synergistic binding of the Vibrio fischeri LuxR transcriptional activator domain and RNA polymerase to the lux promoter region. Proc. Natl. Acad. Sci. 91:12619-12623. Swift, S., J. P. Throup, P. Williams, G. P. C. Salmond, and G. S. A. B. Stewart. 1996. Quorum sensing: a population-density component in the determination of bacterial phenotype. TIBS. 21:214-219. Yanisch-Perron, C., J. Vieira, and J. Messing. 1985. Improved M13 phage cloning vectors and host strains: nucleotide sequences of the M13mp18 and pUC19 vectors. Gene 33:103-119. 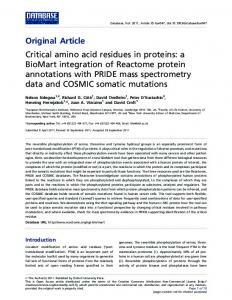 Report "Amino Acid Residues in LuxR Critical for its ... - Semantic Scholar"